After being bummed out about the cost when pricing was released a few months ago, as time passed, I transitioned to thinking about how Booker’s 25th Anniversary was outstanding, and I didn’t want to miss out on lighting striking twice. 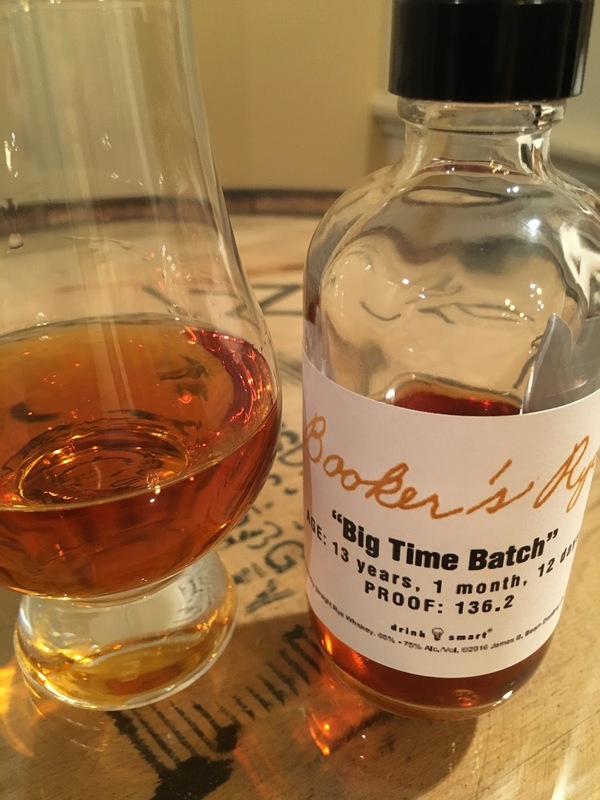 Then I learned that Booker’s Rye was not distilled with Beam’s normal Rye mash bill (which reportedly barely qualifies with 51% rye grain), instead using a reported 70-80% rye grain, and that – as expected – it would be uncut and unfiltered, in the tradition of the Booker’s line. At 13 years old, it’s also a rare find for aged Rye Whiskey, truly qualifying it as a limited release with exclusive company. Velvety, dark amber shifting to brown. Whoa that’s impressive. The aromas hit strong, even from a distance, with fantastic black pepper, cinnamon, leather-bound books, tobacco leaf, clove, and oak. The high rye grain is absolutely evident. Give this one some air before aggressively appreciating the aromas because it’s hot. Whoa that’s intense both in flavors and blazing heat; again, a little air helps clear out the heat and just the balanced intensity remains. The most prominent sweet flavor is brown sugar, and while there’s also some rich caramel and dark, ripened berries, the focus is spice – rye, black pepper, cinnamon, clove, and baking spices. A single cube increased the creaminess, but muted some flavors. There’s big oak too, of course, and it’s balanced wonderfully. Booker’s Rye is a robust beast that should be tried neat, but then after a few sips, add a splash of water for an appreciation of more subtle flavors hidden by the heat. Whoa that’s long. There’s a little more caramel sweetness as it lingers, but the huge swell defines this spicy, drying finish with a hint of mint. Booker’s Rye is serious, and I suspect that it will be talked about as a contender for “Whiskey of the Year.” Some of that talk might be the result of the fascination developing over the past few years for robust, barrel-strength whiskey, which in some cases has meant that consumers sacrifice refinement and complexity. For my preferences, Booker’s Rye was the third-best Rye that I’ve enjoyed to date in 2016, although, to be fair, neither of the other two was released this year, and the best was a practically unattainable 12-year bottling sourced from the Medley Distillery. But if Booker’s Rye is going to be in the discussion for such high accolades, it has to stand up to other highly-acclaimed whiskies. I can’t make the call yet where Booker’s falls in the grand scheme of Rye Whiskey, and while I’m thankful for the sample because I might not find a bottle at retail, my sample size did not give me my normal opportunity for enough tastings to provide a score on The Sipp’n Corn Scale, either. I’ll be looking, that’s for sure, and will update my post. If the price doesn’t shock your conscience, you should be looking too. Despite the cost, my recommendation is a strong buy. So what were the two bottles you enjoyed more? A 12-yr. Old Rip Van Winkle Old Time Rye and a 25-yr. Willett Family Estate Rye. Great analysis and I quite agree. Their definitely has been a demand for cask strength ryes which the market just hasn't been seeing much of…let alone aged cask strength ryes. I also agree that this may be contender for whiskey of the year with certain individuals and its not hard to understand why, but like you say, if so, it will have to stand up to some of the most acclaimed. By the end of the year I hope to have compared Booker's to some of the best. Can't wait for this experiment!